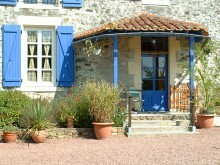 We have three, 3 star self catering cottages (gîtes), all located in the restored farmhouse building with its tiled floors and oak beams, each with their own entrance, outside terrace, and access to the swimming pool, garden, and all the other on-site facilities. 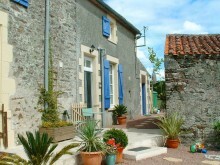 Each gîte sleeps between 4 and 6 people, and the Fountain and Courtyard gîtes can be combined through an interior door to accommodate larger families. 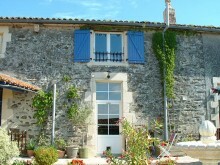 The gîtes are available for rental all year round, with wood burning stoves for the colder months. All services and wood are included in the rental price. Our location is very popular with house hunters looking to buy in the Pays de la Loire and Poitou-Charente regions, with furniture storage available on inquiry.